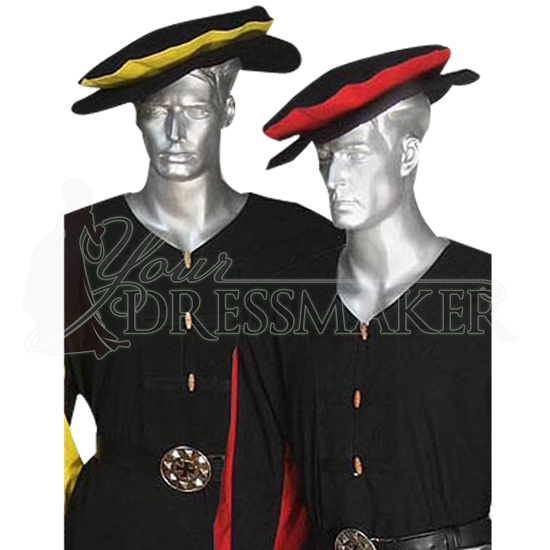 Add a stylish embellishment to your medieval or Renaissance reenactment outfit with the Mens Medieval Floppy Hat, made of 100% cotton and available in a wide assortment of colors and distinct color combinations. The comfort and breathability of its woven cotton construction makes this hat a fantastic choice for everyday historic themed wear. Its wide, floppy brim and slightly puffed crown are modeled after authentic historic styles. One of the most common accessories worn by every manner of person throughout the medieval and Renaissance eras, do not go without the Mens Medieval Floppy Hat at your next medieval LARP event, historic reenactment, or Renaissance festival. When ordering, the first Color dropdown menu is for the main color of the hat. The Accent Color is for the colored strip on the hat.